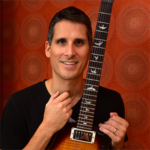 In the first volume of Fretboard Theory you learned about chord progressions and how to play by numbers. Although a great approach to many songs, you may have realized that not all of them fit into this system of numbered barre chord patterns. In Fretboard Theory Volume II Chapter 4 you are going to learn why. We usually think of a song as having a main tonic chord or parent scale. Many songs, however, actually change their tonic at some point. For example, a song’s chord progression may be moved, or transposed up or down by a particular interval for a section. The song’s tonic will then change by that same interval. A bridge or other major section in a song may have a completely different set of chord changes in a new key or tonal center. The song may change from major to minor, or even from one mode to another. When a song changes key in any of these ways, music theorists say that the music has modulated. A modulation is really just a change in key, sounds fancy doesn’t it? 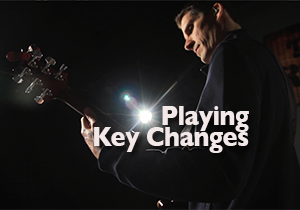 Properly identifying key changes will help you better understand the music you listen to and play. If you are a composer or songwriter, then you will like the variety that key changes offer. Lead guitarists will know when to change their scale patterns for solos as the music modulates from one key to another. Download a free book preview, watch a free video clip, and listen to a related audio podcast episode below. 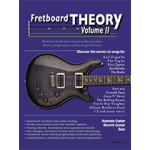 Fretboard Theory Volume II picks up where the first book leaves off and takes your guitar playing and musical knowledge to a whole new level. You learn new musical concepts and explore advanced applications. There is information for rhythm guitarists, lead guitarists, improvisers and composers. Each chapter focuses on applications found in popular music and includes familiar song references.